As agreed by China and Canada, the first China-Canada Economic and Financial Strategic Dialogue will be held in Beijing on November 12. China's State Councilor Wang Yong will co-chair the dialogue with Canada's Minister of Finance Bill Morneau and Minister of International Trade Diversification Jim Carr. The China-Canada Economic and Financial Strategic Dialogue was officially launched in 2017 as a dialogue on strategic, overall and long-term issues in economic and financial fields on a regular basis between China and Canada, which aims to deepen practical cooperation in economic and financial areas between the two countries, strengthen communication and coordination on major international economic and financial issues between the two sides and promote sustained sound growth of China-Canada strategic partnership. Upon agreement, at the first China-Canada Economic and Financial Strategic Dialogue, discussions will be held on macro-economic situation and global economic governance, trade and investment cooperation and financial cooperation, etc. The Foreign Ministry and the People's Government of Heilongjiang Province will hold a promotion event in the South Building at 9:30 am on November 12 under the theme of "China in the New Era: Heilongjiang, a New Path to Revitalization in Partnership with the World". State Councilor and Foreign Minister Wang Yi will deliver a speech. Party Secretary Zhang Qingwei and Governor Wang Wentao of Heilongjiang Province will also address the event. Representatives of foreign diplomats in China are invited to make remarks and interact with the guests. In recent years, Heilongjiang Province has stayed committed to the new development concept and developed itself into a prosperous, strong, democratic, culturally advanced, beautiful and modern province, and scored major achievements. We believe that this promotion event, with focuses on Honglongjiang's outcomes of opening up, such as its active engagement in the Belt and Road Initiative, cooperation with Russia and participation in the China-Mongolia-Russia Economic Corridor, will showcase the province's outstanding ecological environment, cultural and historical resources, socio-economic development achievements and potential. We look forward to your attendance at and coverage of this event. Q: China underwent the third Universal Periodic Review (UPR) at the United Nations Human Rights Council on November 6. Please give us more details. A: On November 6, China underwent the third Universal Periodic Review (UPR) at the United Nations Human Rights Council in Geneva, Switzerland. The UPR mechanism aims to review how well the UN member states fulfill their duties and commitments on human rights on a regular basis. This is the third time for the UN to conduct the regular comprehensive review on the human rights conditions in China after 2009 and 2013. The Chinese government attaches high importance to this review. We have sent a high-level delegation for this UPR, which is headed by Vice Foreign Minister Le Yucheng and comprised of representatives from nearly 20 departments of the central government, the Xinjiang and Tibet Autonomous Regions, and the governments of the Hong Kong and Macao Special Administrative Regions. The Chinese delegation elaborated on the remarkable achievements that China has made in the area of human rights since the last UPR in 2013, expounded the development path with Chinese characteristics and China's outlook on human rights in the new era, illustrated the direction that China adheres to in terms of protecting and promoting human rights and announced the 30 new measures that China will take to safeguard human rights. Vice Foreign Minister Le Yucheng said in his speech that over the past four decades of reform and opening-up, China's human rights cause has been developing steadily and a well-established system to safeguard human rights has been put in place. China has become a country with rapid progress in its human rights cause, which has realized the large-scale poverty alleviation at the fastest pace, improved the institutional system which ensures that the people run the country, continuously enhanced the judicial protection of human rights, safeguarded Chinese citizens' freedom of speech and religious belief in accordance with the law, promoted and protected the rights enjoyed by vulnerable groups in an all-round manner and conducted extensive international exchanges and cooperation on human rights. China has achieved in several decades what took developed countries several centuries to achieve. On China's vast land of 9.6 million square kilometers, nearly 1.3 billion people are living a peaceful, free and happy life, free from war, terror or displacement. It can be said that this is the progress in the area of human rights achieved at the fastest pace and also represents a tremendous contribution made by China to the global human rights endeavor. 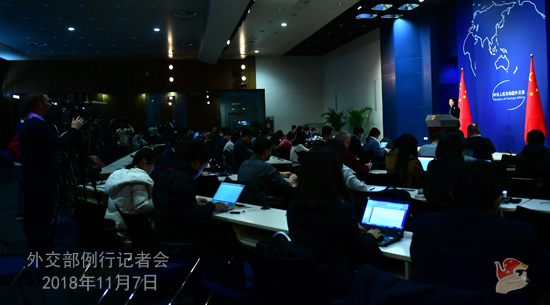 The Chinese delegation took over 300 questions raised by more than 150 countries from a panoramic perspective. We have engaged in good and constructive dialogues with all relevant parties with an open, candid, inclusive and cooperative attitude. 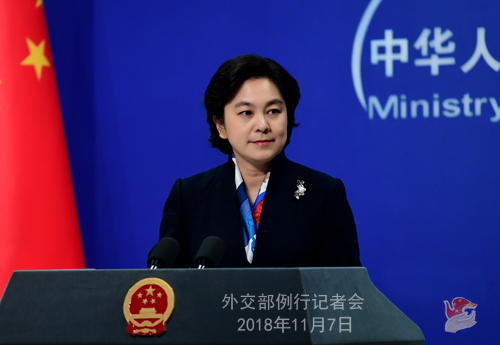 Over 120 countries including Russia, South Africa and Ethiopia took the floor to highly commend China's development achievements, highly recognize the outlook on human rights with Chinese characteristics and speak highly of China's human rights report and the keynote speech delivered by the head of the Chinese delegation. They said that China's experience and practices in safeguarding human rights and the right to development and eliminating poverty are worth learning and drawing upon. Meanwhile, certain western countries politicized the issue of human rights and pointed fingers at China on ethnic, religious and judicial issues. In response to this, the Chinese delegation enumerated a large number of facts and figures to forcefully refute that and make necessary clarifications, underlining that no one knows better than the Chinese people as to whether the human rights conditions in China are good or not and that no country can dictate the definitions and standards of democracy and human rights, let alone impose its own will on others. I want to stress once again that there will always be room for improvement in human rights protection. 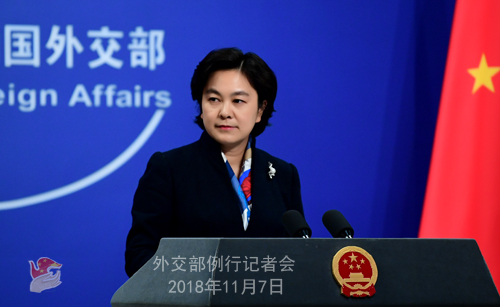 China is willing to step up exchanges and mutual learning with all countries to pursue common progress on the basis of equality and mutual respect and with a responsible and constructive attitude. We will carefully and actively heed those sincere and constructive suggestions. Meanwhile, we firmly oppose and reject the politically-biased, malicious and unreasonable accusations made by a very small number of people. Q: According to reports, Pakistan's Finance Minister said that China has offered immediate assistance to help ease Pakistan's economic crisis. Can you confirm that? A: China and Pakistan are all-weather strategic cooperative partners, and our bilateral relations have been running at a high standard. China has been providing utmost assistance to Pakistan as its capacity allows. We will continue to offer assistance and support within our capacity to Pakistan for its economic and social development in light of its needs and upon agreement by both sides. Q: The results of US mid-term election show that the Republicans will retain control of the Senate while the Democrats have seized control of the House. Given that the US side accused China of interference ahead of the election, what comments does China have on the results of this election? Some believe that a Democrat-led House will put more restraints on President Trump's policies. How do you think this mid-term election will affect China-US relations? A: We noted the mid-term election that was just wrapped up in the US. This is an domestic affair of the US and I won't comment on that. China and the US have consensus on the importance and necessity of maintaining the sound and steady development of China-US relations. Such consensus is also shared by those far-sighted Americans in various sectors. The sustained, sound and steady growth of China-US relations not only serves the fundamental interests of the two countries and peoples, but also contributes to peace, stability and prosperity in the Asia-Pacific and beyond. China stands ready to work with the US to properly manage differences on the basis of mutual respect, and expand practical cooperation based on mutual benefit and reciprocity, and move forward China-US relations in the right direction. Q: According to reports, President of the Council of State and Council of Ministers of Cuba is now in Beijing. Is he going to meet with President Xi Jinping today? A: President of the Council of State and Council of Ministers of Cuba Miguel Diaz Canel Bermudez has attended the China International Import Expo and is on a state visit to China. As you just said, he will be meeting with the Chinese leadership soon. We will release relevant information in a timely manner and please stay tuned. Q: Pakistan's Prime Minister Imran Khan has just wrapped up his visit to China. During the visit, he met and held talks with top Chinese leadership and attended the first China International Import Expo. The two sides signed agreements on future cooperation and issued a joint communique after the visit. What is your comment on the outcome of Prime Minister Imran Khan's visit? A: We believe that Prime Minister Imran Khan's visit to China is successful. The two sides issued a joint communique which elaborated on the specific outcomes of this visit. The outcomes can be summed up as follows: First, this visit deepened the friendship between the leaders from the two countries. This visit is Prime Minister Imran Khan's first official visit to China after he assumed office, which fully testifies to the importance Pakistan attaches to developing its ties with China. President Xi Jinping, Premier Li Keqiang and other Chinese leaders held friendly exchanges with Prime Minister Imran Khan on separate occasions and established good relations with him. Second, this visit cemented the special China-Pakistan friendly relations. The two sides believed that the China-Pakistan relations have withstood the test of time as well as the changes in international and domestic landscapes and kept moving forward. The two sides agreed that we should further strengthen the China-Pakistan all-weather strategic cooperative partnership and forge a closer China-Pakistan community with a shared future in the new era. Third, the visit expanded our strategic communication. The leaders from the two countries had an in-depth exchange of views on bilateral ties and international and regional issues of mutual interest and reached important consensus. The two sides agreed to establish the foreign ministers' strategic dialogue mechanism through which we can plan for and coordinate bilateral relations and across-the-board cooperation. Fourth, the visit promoted practical cooperation and friendly exchanges. The two sides agreed to firmly advance the China-Pakistan Economic Corridor (CPEC), set up the task force on social and livelihood projects to constantly enrich and expand the CPEC. The two sides also agreed to step up cooperation in economy and trade, finance, science and technology, agriculture and cultural and people-to-people exchanges and signed 15 cooperation agreements covering relevant areas. Fifth, the visit enhanced our coordination and cooperation on international and regional affairs. The two countries reaffirmed their support for multilateralism, free trade and win-win cooperation as well as their commitment to promoting the lasting peace and common prosperity of the region and beyond. Both China and Pakistan are satisfied with the outcomes of Prime Minister Imran Khan's visit. The two sides agreed to make concerted efforts to implement all the consensus reached by the leaders of the two countries and elevate the China-Pakistan all-weather strategic cooperative partnership to a new height. Q: First, does China see the US mid-term election as an opportunity to recalibrate on the trade issue and open up a chance for some kind of settlement? Second, sources have it that a visitor is coming from the US to China tomorrow. Do you have more details? Third, on the meeting between President Xi Jinping and President Trump at G20, do you have more information on that? A: Let me take your second question first. China and the United States maintain exchanges at all levels and in various fields. I am not sure who this visitor from the US is. If there is an important visit, I believe the Chinese side will release the information in time. Regarding your first question, like I said in my previous reply, the mid-term election is an internal affair of the United States. Regardless of the results of the election, China's recognition of the importance of China-US relations will remain unchanged. In view of such importance, the two governments and peoples, including the leaders of both sides, all hope to maintain the healthy and steady development of China-US relations, which is in the common interests of the two countries and the world and meets the shared aspiration of far-sighted persons in both countries. We hope that the US will work with China with mutual respect, properly manage differences, and continue to expand and deepen the pragmatic cooperation between the two sides in a spirit of equality and mutual benefit. When President Xi Jinping spoke on the phone with President Trump the other day, the two heads of state agreed that both sides should strive to maintain the healthy and stable development of China-US relations, constantly expand China-US economic and trade cooperation, and instruct the economic teams on both sides to maintain communication and consultation to translate such aspiration into reality. We hope that the economic teams of the two sides will strengthen contact and communication and conduct consultations on issues of mutual concern to seek an arrangement on the China-US economic and trade issue that is acceptable to both sides. As for the meeting on the sidelines of the G20 Summit in Argentina, the two heads of state said in the telephone call that they look forward to meeting again on the sidelines of the G20 Summit in Argentina and conducting an in-depth discussion on China-US relations and other major issues. The two sides maintain communication in this regard. Q: According to reports, US Department of State said that the DPRK-US high-level dialogue scheduled tomorrow has been postponed. Do you have any comment on that? A: When the DPRK and the US will talk to each other should be decided by the two sides. China's position on the DPRK-US dialogue is clear-cut. China always supports the DPRK-US dialogue. We hope that the DPRK and the US, through dialogues at all levels, including the leaders' summit, can continuously enhance mutual trust, implement the consensus that has been reached, address each other's legitimate concerns and advance the denuclearization of the Korean Peninsula and the political settlement process of the Korean Peninsula issue.